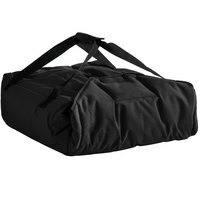 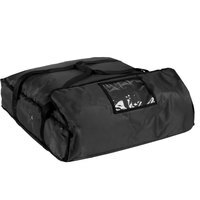 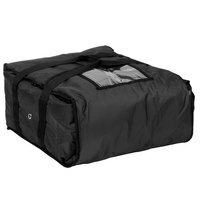 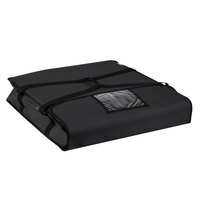 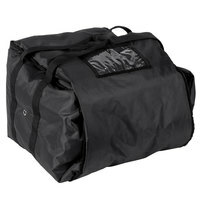 We carry both vinyl and nylon exterior bags that are built to withstand frequent, heavy-duty use, and they are waterproof for deliveries in wet weather. 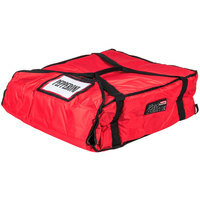 Choose from single bags or deluxe cases designed with racks to carry multiple pizza boxes at a time. 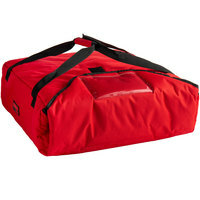 We carry bags in several colors to suit your restaurant's logo and theme, and these delivery bags aren't just limited to pizza! 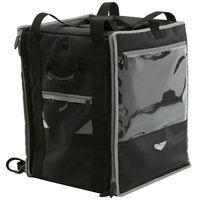 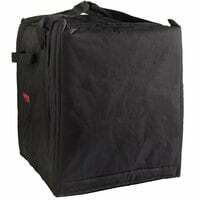 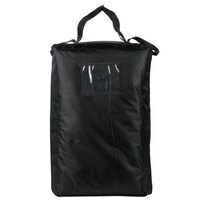 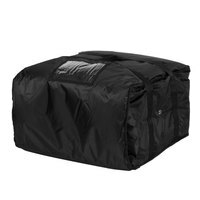 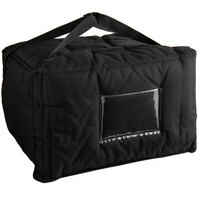 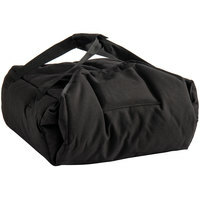 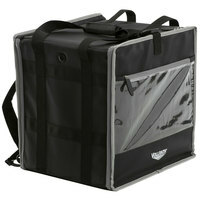 Check out insulated nylon bags for deli food trays and other sandwich shop products. 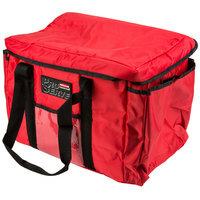 Also make sure to check out other great items from Choice, ServIt, American Metalcraft, Cambro, Rubbermaid, San Jamar and Sterno Products. 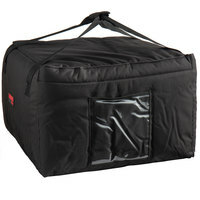 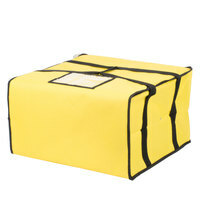 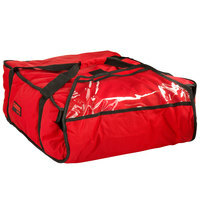 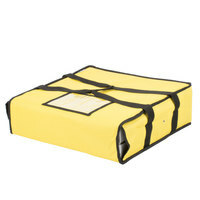 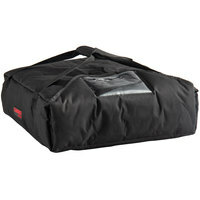 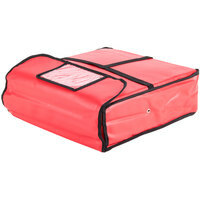 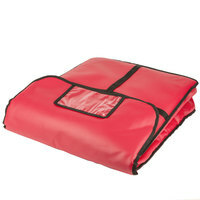 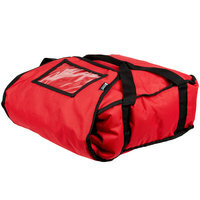 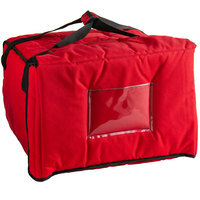 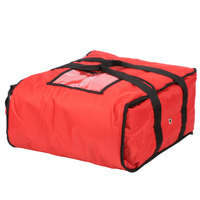 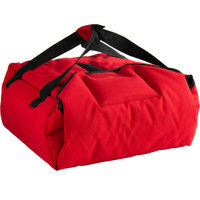 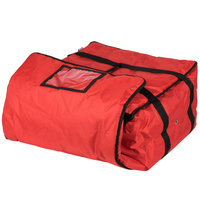 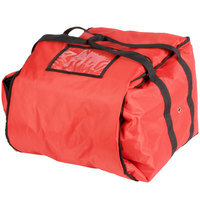 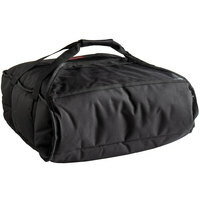 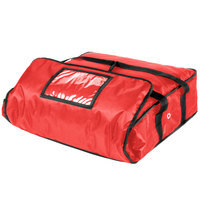 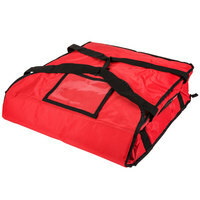 Nylon pizza delivery bags are water resistant, so they'll keep their contents safe from brief exposure to the elements. 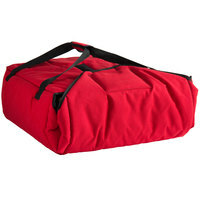 Because vinyl doesn't absorb moisture, these handy pizza delivery bags are easy to clean in case of messes. 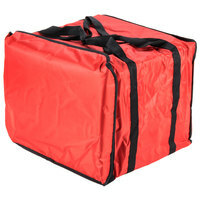 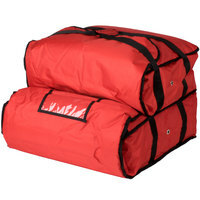 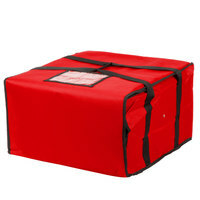 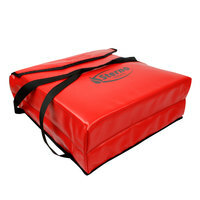 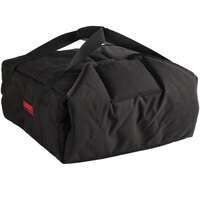 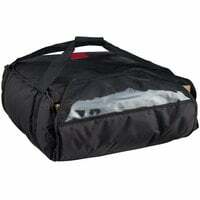 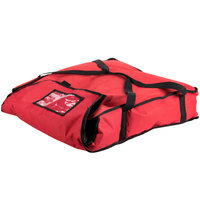 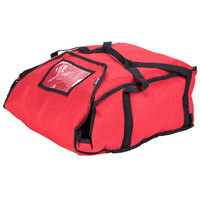 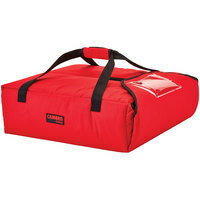 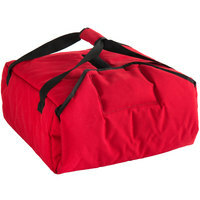 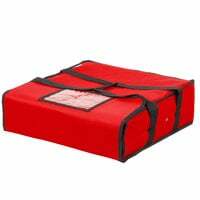 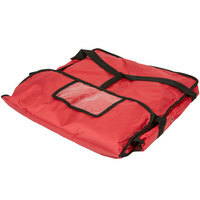 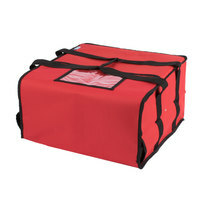 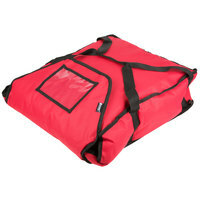 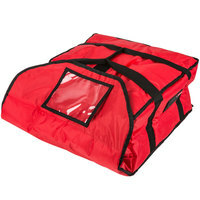 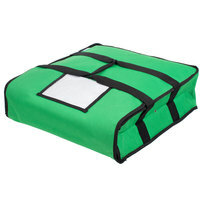 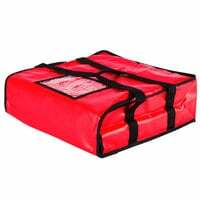 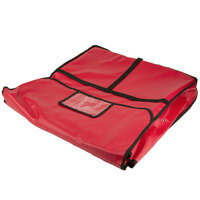 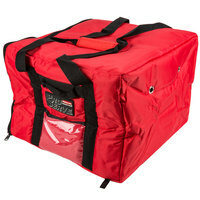 These durable pizza delivery bags have hardboard bottoms that can support heavy loads of food. 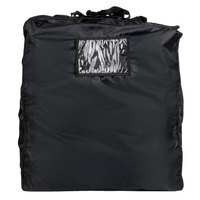 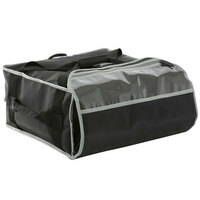 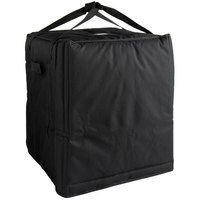 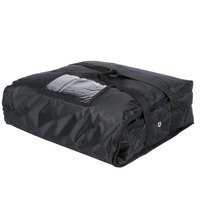 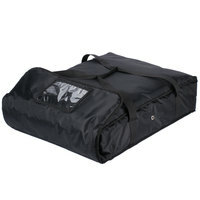 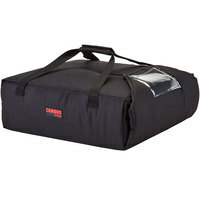 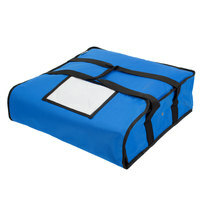 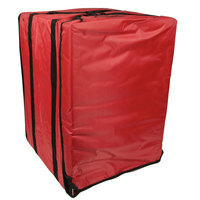 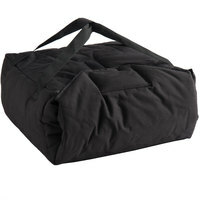 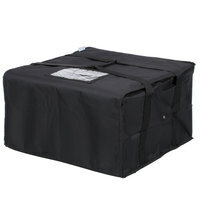 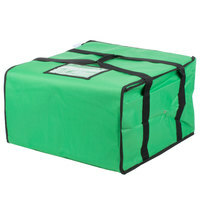 These delivery bags have removable racks that are easy to clean and can also be reconfigured. 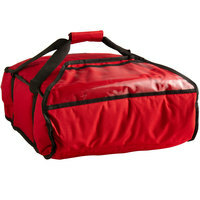 You can use standard pizza delivery bags to transport a variety of foods from your restaurant or pizzeria. 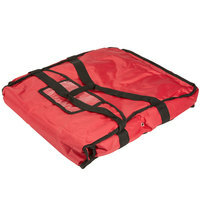 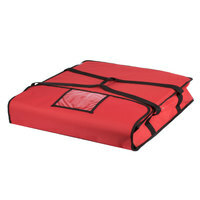 plusServIt Soft-Sided Heavy-Duty Insulated Pizza Delivery Bag, Red Nylon - Dual Compartment, 20" x 20" x 14"
Rubbermaid FG9F3800RED ProServe Insulated Delivery Bag Medium Pizza / Catering / Sandwich Bag Red Nylon 17" x 17" x 13"
Rubbermaid FG9F3700RED ProServe Insulated Large Pizza Delivery Bag Red Nylon 21 1/2" x 19 3/4" x 7 3/4"
Rubbermaid FG9F4000RED ProServe Insulated Sandwich Delivery Bag Red Nylon 15" x 12" x 12"
Rubbermaid FG9F3500RED ProServe Insulated Small Pizza Delivery Bag Red Nylon 18" x 18" x 5 1/4"
Rubbermaid FG9F3600RED ProServe Insulated Medium Pizza Delivery Bag Red Nylon 18" x 17 1/4" x 7 3/4"
Designed to handle large and small orders, these insulated pizza delivery bags are just what your business needs to keep orders hot during transport. 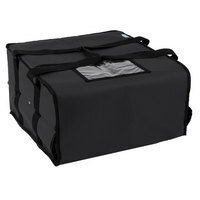 Choose from durable vinyl and glossy nylon exteriors with handy features like carrying straps, secure closures, and interior racks. 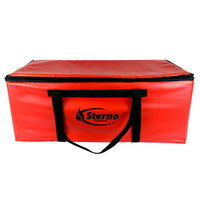 Need other pizza supplies for your takeout service? 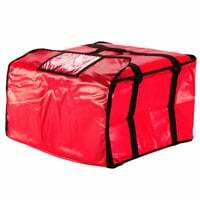 Our corrugated pizza boxes allow you to serve hot pizza pies in style with decorative printed patterns and sturdy box constructions. 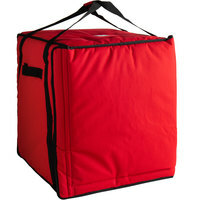 Along with these boxes, don’t forget about pizza stackers to prevent cheese from sticking to the top of your pizza boxes! 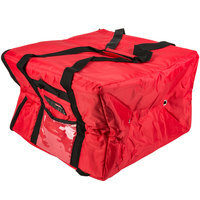 Check out foil take out containers with lids for other Italian specialties that you may be delivering to customers including spaghetti, chicken parmesan, and ravioli. 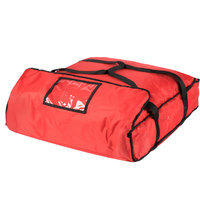 If you're wondering where to buy pizza delivery bags, we have a large selection of pizza delivery bags for sale at the lowest prices.